Meditation can sometimes be a bit of a challenge especially if your having a hard time focusing. 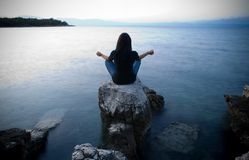 Meditation is basically getting to the point where you have no thoughts and its within that zero point is where you are most connected with source energy. Here are some ways to focus if you are having trouble with wandering thoughts! Light a candle and stare at the flame. Watch the flame move around, get bigger and smaller, and become completely entranced by it. Make sure you keep your eyes open, if you start to feel the need to close them, try to blow out the candle before you do, because you know, fire hazard! This is a good one to put your focus into your breathing as breathing is very important in meditation. Get a metronome, (you can get free ones online or free apps on your phone) and set it to about 80 bpm (beats per minute) to start, or where you feel comfortable. Breath in for four on each tick and then breath out for four on each tick. As you get better, you can slow down the bpm. Metronomes are used by musicians to keep time/rhythm. Mandalas are a spiritual symbol representing the universe in Hinduism and Buddhism. You can find mandalas online or draw one yourself. You meditate on them by staring and putting all your focus into the center.